Pelenna Patchworks: New Riley Blake Designs Willow range available! New Riley Blake Designs Willow range available! Brand new to the site today we have 24 fabrics comprising the whole Willow patchwork fabric range by My Mind's Eye for Riley Blake Designs. Fresh and contemporary, with prints including florals, geometric designs and tonal fabrics in grey, aqua, yellow and pink, this range would be ideal to brighten up any modern home! Also available are fat quarter packs and stash packs in each of the different colourways - aqua, pink and yellow. 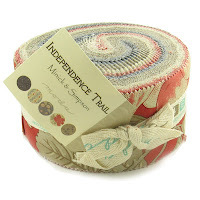 Also recently added to the website were jelly rolls and layer cakes from two new Moda ranges - Independence Trail and Padstow Range. Check out the Moda Bake Shop for new recipes! Hi and welcome to the Pelenna Patchworks blog! Keep up to date with our latest products and quilting related projects here. Popular Patchwork - articles, forum and more!